Being an Indian with coarse & dry hair, I have tried many hair oils over the years.. My all time favorite has to be coconut oil.. It is inexpensive and quite nourishing for the hair.. However, its quite sticky and I do not like my hair to be weighed down by it.. So, I use the coconut oil as a pre-wash conditioning treatment.. I apply a small amount and spread it evenly onto my hair.. I then massage it into the scalp to stimulate blood circulation.. I usually leave this overnight and wash it off with shampoo the next day.. This can also be used 1-2 hours prior to hair wash.. So, I have been on the hunt for a light oil that I can use after washing my hair.. 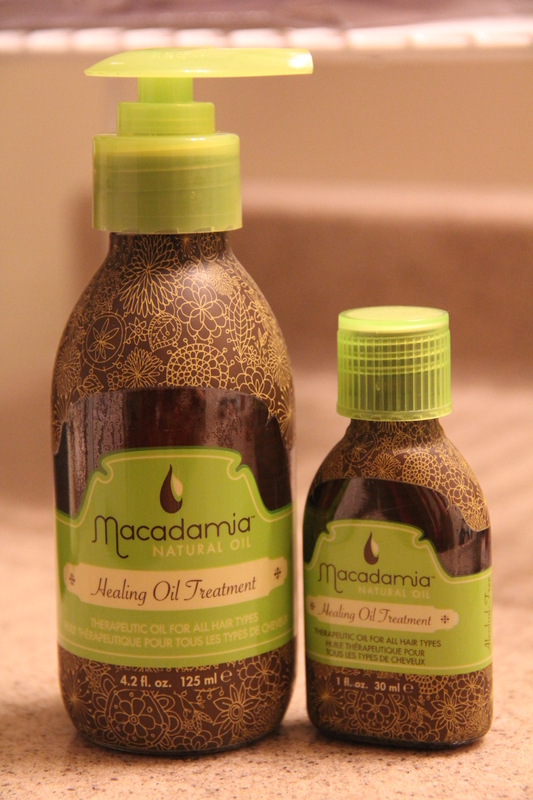 The hunt was over when I tried the ‘Macademia Natural Oil – healing oil treatment’.. I purchased a small trial size of 30ml first.. It is a non-sticky oil.. I use about a pea-size amount and apply it all over my hair – I repeat this twice since I have quite a bit of hair.. Its much easier to comb hair after use.. It makes my hair really smooth and doesn’t feel heavy on the hair.. The oil does not have any strong scent and I cannot smell anything once its in my hair.. I loved it so much that I had to get the larger size (125 ml)!